Steven Ellison, who performs as Flying Lotus, is by no means a new or undiscovered artist. He is however, an incredibly unique musician who has somehow managed to fly under the radar of most music buffs. Through blending elements of jazz, hip-hop, electronic and downtempo, Flying Lotus creates a sound that will leave new listeners aggravated that they’ve only just discovered him. After cycling through his vast discography, Flying Lotus’s overall sound is virtually indescribable. His first album “1983,” released in 2006, is heavily synth-based. Most of the tracks create spacey atmospheres that border on eerie. However, jump to 2010 when Flying Lotus released his most recent studio album, “Cosmogramma,” and the tracks’ sounds are incomparable. In between “1983” and “Cosmogramma” were numerous EPs and one additional full-length release that help track Flying Lotus’ progression as an artist. The full album, 2008’s “Los Angeles” marks Flying Lotus’s leap from slow-paced soundscapes to more complex and intricate electronic pieces. Take the track “Beginners Falafel” for example, which starts up with what can only be described as an explosion of electronic notes that progressively climb until they fade into the beat. This technique forces the listener to consider Flying Lotus’s diligent work ethic for composing music. A brief look into the artist’s family history provides some explanation behind his immense musical creativity. As it turns out, Flying Lotus’ great aunt is jazz pianist and composer Alice Coltrane. Alice Coltrane is the wife of arguably the most talented jazz musician of all time, John Coltrane. Additionally, Lotus’ cousin is jazz saxophonist Ravi Coltrane. Lotus flaunts his jazz lineage on “Cosmogramma,” which is widely regarded as his most accomplished album. With “Cosmogramma,” Lotus truly defines himself as more than just another electronic music producer. Combining elements of jazz and using real instruments rather than solely synthesizers, he was able to create one of the most complex albums of the year. Through maintaining his electronic and hip-hop oriented style, Flying Lotus successfully combines intricacy and accessibility to create one of the few recent albums to be considered “musically complex,” according to a Socialist Review article. 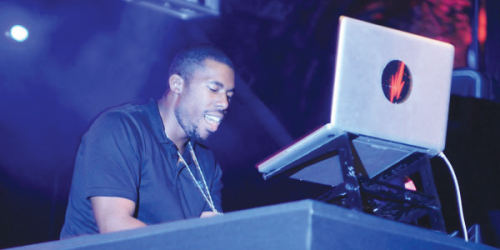 Although “Cosmogramma” is Flying Lotus’s biggest milestone of his musical career so far, it is important to note the quality of his other albums. “Los Angeles” possesses numerous hip-hop sounding songs that trump the beats of producers who set out to make hip-hop. Certain rappers have caught on to this and started using Flying Lotus’s instrumentals to rap over. The rapper Blu, for example, used Flying Lotus’s track “GNG BNG” for one of his recent songs. The fact that rappers have started using Flying Lotus’ songs as beats raises one major question: Why doesn’t Flying Lotus reach out to artists and compose beats specifically for them? The only logical answer is that Flying Lotus does not need lyrics to help construct his music. He has mastered the art of using sound to convey themes.